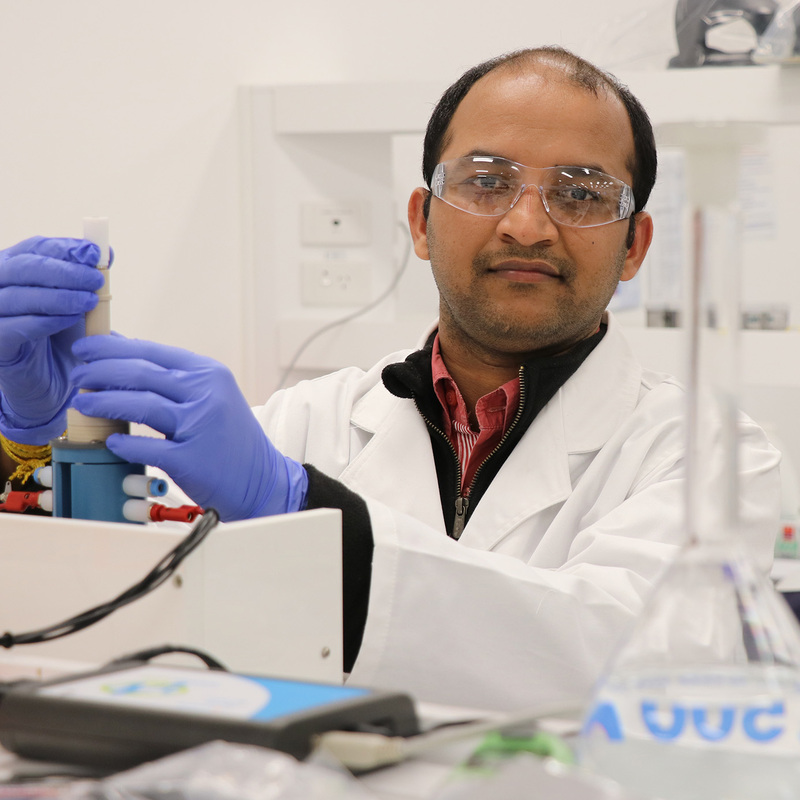 Dr. Siddulu Naidu Talapaneni is a Research Associate at the Global Innovative Center for Advanced Nanomaterials (GICAN), The University of Newcastle (UON), Australia. He received BSc degree, first class with distinction from Sri Venkateswara University, Tirupati, India in 2005. He studied MS in Chemistry from 2005-2007 at the National Institute of Technology (NIT)-Warangal, India. He obtained his MS thesis in the group of Dr. K. R. Justin Thomas from Chemistry department at the Indian Institute of Technology (IIT)-Roorkee, India. From 2007-2009, he worked as a Research Associate in GVK Biosciences Private Limited, Hyderabad, India. Then, he moved to Japan in 2009 and completed PhD in July 2012 in the group of Prof. Ajayan Vinu at the World Premier International Center for Materials Nanoarchitectonics (WPI-MANA) based on National Institute for Materials Science (NIMS), a number one materials science institute in Japan based at Tsukuba, Japan in collaboration with Hokkaido University, Sapporo, Japan. Soon after finishing PhD in Japan, he joined as the research scientist in the group of Dr. Svetlana Mintova at the laboratory of catalysis and spectrochemie (LCS), ENSICAEN in Caen, France. Later in 2014, he moved to the Korea Advanced Institute of Science and Technology (KAIST), Daejeon, South Korea to work with Prof. Ali Coskun in the Multifunctional Organic NanoArchitectures (MONA) lab and remained there until 2016. From 2016 to 2017, he worked in Prof. Ajayan Vinu group at Future Industries Institute (FII), University of South Australia. In October 2017, he moved along with Prof. Ajayan Vinu to establish a newly created Global Innovative Center for Advanced Nanomaterials (GICAN) research center at UON, Newcastle. His research interests focus on the design and development of multifunctional nanoporous materials for adsorption/separation, capturing and sensing of flue and toxic gases, CO2 capture and conversion technologies, heteregeneous catalysis, electrodes in efficient energy storage devices such as batteries and supercapacitors. He has published more than 40 original research papers in high impact factor journals including Nature Materials, Chemical Society Reviews, Angewandte Chemie International Edition, Advanced Functional Materials, Chemistry of Materials, Journal of Materials Chemistry A, ACS Applied Materials and Interfaces, ChemSusChem and Chemical Communications, etc. He is the recipient of Lindau Young Scientist Award from Australian Academy of Sciences through Science and Industry Endowment Fund (SIEF) to attend 67 Lindau Nobel Laureates Meeting on Chemistry at Lindau, Germany. (One in life-time opportunity to meet and discussion with the 50 Nobel Laureates in one place, only 8 Australian delegates per year given the opportunity). Copyright © 2018 American Chemical Society. Since the first reports of Cu dendrimer-encapsulated nanoparticles (DENs) published in 1998, the dendrimer-templating method has become the best and most versatile method for preparing ultrafine metallic and bimetallic nanoparticles (1-3 nm) with well-defined compositions, high catalytic activity, and tunable selectivity. However, DENs have remained for the most part model systems with limited prospects for scale up and integration into high-performance and reusable catalytic modules and systems for industrial-scale applications. Here, we describe a facile and scalable route to the preparation of catalytic polyvinylidene fluoride (PVDF) membranes with in situ synthesized supramolecular dendrimer particles (SDPs) that can serve as hosts and containers for Pt(0) nanoparticles (2-3 nm). These new catalytic membranes were prepared using a reactive encapsulation process similar to that utilized to prepare Pt DENs by addition of a reducing agent (sodium borohydride) to aqueous complexes of Pt(II) + G4-OH/G6-OH polyamidoamine (PAMAM) dendrimers. However, the SDPs (2.4 µm average diameter) of our new mixed matrix PVDF-PAMAM membranes were synthesized in the dope dispersion without purification prior to film casting using (i) a low-generation PAMAM dendrimer (G1-NH2) as particle precursor and (ii) epichlorohydrin, an inexpensive functional reagent, as cross-linker. In addition, the membrane PAMAM particles contain secondary amine groups (~1.9 mequiv per gram of dry membrane), which are more basic and thus have higher Pt binding affinity than the tertiary amine groups of the G4-OH and G6-OH PAMAM dendrimers. Proof-of-concept experiments show that our new PVDF-PAMAM-G1-Pt/membranes can serve as highly active and reusable catalysts for the hydrogenation of alkenes and alkynes to the corresponding alkanes using (i) H2 at room temperature and a pressure of 1 bar and (ii) low catalyst loadings of ~1.4-1.6 mg of Pt. Using cyclohexene as model substrate, we observed near quantitative conversion to cyclohexane (~98%). The regeneration studies showed that our new Pt/membrane catalysts are stable and can be reused for five consecutive reaction cycles for a total duration of 120 h including 60 h of heating at 100 °C under vacuum for substrate, product, and solvent removal with no detectable loss of cyclohexene hydrogenation activity. The overall results of our study point to a promising, versatile, and scalable path for the integration of catalytic membranes with in situ synthesized SDP hosts for Pt(0) nanoparticles into high-throughput modules and systems for heterogeneous catalytic hydrogenations, an important class of reactions that are widely utilized in industry to produce pharmaceuticals, agrochemicals, and specialty chemicals. © 2016 Elsevier Ltd. The properties of tin containing MFI type zeolite nanocrystals (Sn-MFI) synthesized under hydrothermal conditions from colloidal suspensions, and further application for selective detection of automotive exhaust gases (CO, CO2, NOx) are reported. The properties of the Sn-MFI nanosized zeolite are compared with the pure silicalite-1 nanocrystals (Si-MFI) synthesized under identical conditions, and used as a reference. Additionally, both samples (Si-MFI and Sn-MFI) with high crystallinity and high porosity were stabilized in coating suspensions and deposited in films by spin-coating approach. The Si-MFI and Sn-MFI samples as self-supported pellets and thin films were exposed to different concentrations of exhaust gases in the presence of 100 ppm of water. The sorption behavior of the Sn-MFI and the Si-MFI towards CO, CO2, NO and NO2 gases was followed by in situ IR spectroscopy. The influence of the tin concentration in the zeolite nanocrystals and the type of assembly (self-supported pellets and films) on the gas detection was studied. The fast detection of NO2 with the Sn-MFI sample in comparison to the other gases implies that the tin containing zeolite could be considered for further use a selective material for detection of low concentrations of NO2 (0-20 ppm). © 2016 American Chemical Society. We present an efficient strategy for the preparation of conjugated microporous polymers incorporating pillararenes (P5-CMPs) with surface areas up to 400 m2 g-1 via Pd-catalyzed Sonogashira-Hagihara cross-coupling reaction of triflate functionalized pillararene with 1,4-diethynylbenzene and 4,4&apos;-diethynyl-1,1&apos;-biphenyl linkers. In an effort to transfer intrinsic properties of pillararene, that is its ability to form strong host-guest complexes with linear hydrocarbons in solution, into the solid-state, we investigated the affinity of P5-CMPs toward propane gas. Unlike previously reported porous solids, which showed isosteric heats of adsorption (Qst) for propane in the range of 32.9-36.9 kJ mol-1 at zero coverage and increasing Qst with rising loading due to intermolecular interactions between propane molecules, we observed very high Qst values up to 53 kJ mol-1 at zero coverage, which gradually decreased to ~35 kJ mol-1 with increasing loadings. This observation indicates strong supramolecular host-guest complexation between propane and pillararene via multiple C-H/p interactions, i.e., "macrocyclic effect" arising from the ideal size match of kinetic diameter of propane to the cavity of pillararene. This approach also allowed us to introduce thermodynamic selectivity for the separation of saturated hydrocarbons with low polarizability. High affinity of P5-CMPs for propane facilitated its efficient breakthrough separation from a simulated natural gas mixture (methane:propane, 9:1) at 298 K.
© The Royal Society of Chemistry. Porous cationic polymers (PCPs) with surface areas up to 755 m2g-1bearing positively charged viologen units in their backbones and different counteranions have been prepared. We have demonstrated that by simply varying counteranions both gas sorption and catalytic properties of PCPs can be tuned for metal-free capture and conversion of CO2into value-added products such as cyclic carbonates with excellent yields. © 2016 Wiley-VCH Verlag GmbH & Co. KGaA, Weinheim. A covalent triazine framework (CTF) with embedded polymeric sulfur and a high sulfur content of 62 wt % was synthesized under catalyst- and solvent-free reaction conditions from 1,4-dicyanobenzene and elemental sulfur. Our synthetic approach introduces a new way of preparing CTFs under environmentally benign conditions by the direct utilization of elemental sulfur. The homogeneous sulfur distribution is due to the in situ formation of the framework structure, and chemical sulfur impregnation within the micropores of CTF effectively suppresses the dissolution of polysulfides into the electrolyte. Furthermore, the triazine framework facilitates electron and ion transport, which leads to a high-performance lithium-sulfur battery. © 2016 American Chemical Society. A variety of advanced electrode structures have been developed lately to address the intrinsic drawbacks of lithium-sulfur batteries, such as polysulfide shuttling and low electrical conductivity of elemental sulfur. Nevertheless, it is still desired to find electrode structures that address those issues through an easy synthesis while securing large sulfur contents (i.e., > 70 wt %). Here, we report an orthogonal, "one-pot" synthetic approach to prepare a sulfur-embedded polybenzoxazine (S-BOP) with a high sulfur content of 72 wt %. This sulfur-embedded polymer was achieved via thermal ring-opening polymerization of benzoxazine in the presence of elemental sulfur, and the covalent attachment of sulfur to the polymer was rationally directed through the thiol group of benzoxazine. Also, the resulting S-BOP bears a homogeneous distribution of sulfur due to in situ formation of the polymer backbone. This unique internal structure endows S-BOP with high initial Coulombic efficiency (96.6%) and robust cyclability (92.7% retention after 1000 cycles) when tested as a sulfur cathode. © 2015 American Chemical Society. Postcombustion CO2 capture and the conversion of captured CO2 into value added chemicals are integral part of today&apos;s energy industry mainly due to their economic and environmental benefits arising from the direct utilization of CO2 as a sustainable source. Sterically confined N-heterocyclic carbenes (NHCs) have played a significant role in organocatalysis due to their air-stability, super basic nature, and strong ability to activate and convert CO2 gas. Here, we report a new class of nanoporous polymer incorporating sterically confined N-heterocyclic carbenes (NP-NHCs) that exhibit exceptional CO2 capture fixation efficiency of 97% at room temperature, which is the highest ever reported for carbene based materials measured in the solid state. The NP-NHC can also function as a highly active, selective, and recyclable heterogeneous nanoporous organocatalyst for the conversion of CO2 into cyclic carbonates at atmospheric pressure with excellent yields up to 98% along with 100% product selectivity through an atom economy reaction by using epoxides. Narrow pore size distribution of NP-NHC also allowed us to introduce a unique substrate selectivity based on size, just like enzymes, for the corresponding epoxides. This metal-free two in one approach for the CO2 gas fixation/release and conversion provides a new direction for the cost-effective, CO2 capture and conversion processes. University of Newcastle’s Dr Siddulu Naidu Talapaneni has been awarded the title of 2018 CAS SciFinder Future Leader, recognising him as an up-and-coming leader in shaping the future of scientific information and innovation.